The Budini (Ancient Greek: Βουδίνοι; Boudínoi) was a group of people (a tribe) described by Herodotus and several later classical authors. Described as nomads living near settled Gelonians, Herodotus located them east of the Tanais river (which is usually assumed to correspond with modern Don River) beyond the Sarmatians. Pliny the Elder mentions the Budini together with the Geloni and other peoples living around the rivers which drain into the Black Sea from the north. During the European Scythian campaign of Darius I, in which the Persian king invaded the Scythian lands of Eastern Europe, the Budini were allies of the Scythians. During the campaign, he captured and burnt down one of the Budini's large fortified cities. The Budini are also mentioned by Classical authors in connection with reindeer. Both Aristotle and Theophrastus have short accounts – probably based on the same source – of an ox-sized deer species, named tarandos, living in the land of the Budines in Scythia, which was able to change the colour of its fur to obtain camouflage. The latter is probably a misunderstanding of the seasonal change in reindeer fur colour. [4.108] The Budini are a great and populous nation; the eyes of them all are very bright, and they are ruddy. They have a city built of wood, called Gelonus. The wall of it is three and three quarters miles in length on each side of the city; this wall is high and all of wood; and their houses are wooden, and their temples; for there are temples of Greek gods among them, furnished in Greek style with images and altars and shrines of wood; and they honor Dionysus every two years with festivals and revelry. For the Geloni are by their origin Greeks, who left their trading ports to settle among the Budini; and they speak a language half Greek and half Scythian. But the Budini do not speak the same language as the Geloni, nor is their manner of life the same. The Budini are indigenous; they are nomads, and the only people in these parts that eat fir-cones; the Geloni are farmers, eating grain and cultivating gardens; they are altogether unlike the Budini in form and in coloring. Yet the Greeks call the Budini too Geloni; but this is wrong. Their whole country is thickly wooded with every kind of tree; in the depth of the forest there is a great, wide lake and a marsh surrounded by reeds; otter is trapped in it, and beaver, besides certain square-faced creatures whose skins are used to trim mantles, and their testicles are used by the people to heal sicknesses of the womb. The definitive origin or the ethnic composition of Budini - if they indeed existed as a singular entity Herodotus and later authors had described - remains unknown. The general consensus is that the Budini correspond to Yukhnovo culture [ru]. Boris Rybakov was the first to suggest that Budini correspond to Yukhnovo culture [ru], a view now held by the majority of historians. He considered the latter to be ethnically proto-Slavic, and, together with Boris Grakov, further theorised that, considering the probable, relatively large, population numbers of the Budini, which he inferred from the archeological evidence, the Budini must have inhabbited a relatively large territory, likely stretching from Voronezh forest steppe to Poltava forest steppe. However, he also did not rule out a possible relation with proto-Balts. He also suggested the Budini had cults dedicated to Lada, a goddess of Balto-Slavic mythology. 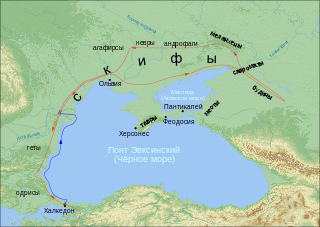 On the other hand, Nikolai Derzhavin [ru], who also argued that they were proto-Slavic, determined their location at the time of Herodotus to be between the middle Dnepr and the upper reaches of Don river stretching further up to the limits of the Volga river basin. Zbigniew Gołąb argued that they were a confederation of people who spoke the Proto-Slavic language, from which Greeks inferred their name which was an exonym meaning "tribesmen" in their native language. The 1911 edition of Encyclopaedia Britannica surmises that the Budini were Finno-Ugric, of the branch now represented by the Udmurts and Komis. Estonian amateur historian and nationalist Edgar V. Saks identifies Budini as the Finnic Votic people, a theory Urmas Sutrop described as "pseudoscientific". Other theories see in them the ancestors of Finnish people, or the ancestors of Mordvins or Permians. Bel'skoe site [ru] - a prominent archeological site in what is now north-eastern Ukraine. The remains of this 5th century B.C. settlement are usually associated with Budini. Wikisource has the text of the 1911 Encyclopædia Britannica article Budini. ^ Herodotus, The Histories, iv. 21. ^ Boardman 1982, pp. 239-243. ^ Georg Sarauw, "Das Rentier in Europa zu den Zeiten Alexanders und Cæsars" [The reindeer in Europe to the times of Alexander the Great and Julius Caesar], In Jungersen, H. F. E. and Warming, E.. Mindeskrift i Anledning af Hundredeaaret for Japetus Steenstrups Fødsel (Copenhagen 1914), pp. 1–33. ^ Herodotus, with an English translation by A. D. Godley. Cambridge. Harvard University Press. 1920. ^ a b Граков, Борис Николаевич (1971). Скифы. Moscow. pp. 131–132, 160. ^ Gorbanenko, Sergey. "Каравайко Д.В., Горбаненко С.А. Господарство носіїв юхнівської культури. — К.: Наук. думка, 2012. — 304 с." ^ Patrushev, V. (1995): Uralic Nations of Russia: Historic Development and Present Condition. pp. 97–116. ^ Rybakov, Boris (1987). Язычество Древней Руси [Paganism in Ancient Rus'] (in Russian). Moscow: Nauka. ^ Александр, Свободин. "БУДИНЫ - Происхождение восточного славянства (история и современное состояние вопроса)". www.e-reading.club. Retrieved 2018-06-03. ^ Zbigniew., Gołąb, (1992). The origins of the Slavs : a linguist's view. Columbus, Ohio: Slavica Publishers, Inc. p. 166. ISBN 0893572314. OCLC 26994940. ^ James Hastings, "Encyclopedia of Religion and Ethics" (1921), p. 588. ^ Chisholm, Hugh, ed. (1911). "Budini" . Encyclopædia Britannica. 4 (11th ed.). Cambridge University Press. p. 751. ^ Edgar V. Saks, Eesti viikingid (Tallinn 2005), p. 16. ^ Sutrop, Urmas (2004). Erelt, M, ed. "Liivimaa kroonika Ykescola ~ Ykescole ja Üksküla. Tõnu Karma 80. sünnipäevaks" (PDF). Emakeele Seltsi aastaraamat (in Estonian). Tallinn: Emakeele Selts: 89. Boardman, John, ed. (1982). The Cambridge Ancient History. 10: Persia, Greece, and the Western Mediterranean. Cambridge, UK: Cambridge University Press. pp. 239–243. ISBN 978-0521228046. Dažbog, alternatively Daždźboh, Dazhdbog, Dazhbog, Dajbog, Daybog, Dabog, or Dadzbóg, was one of the major gods of Slavic mythology, most likely a solar deity and possibly a cultural hero. He is one of several authentic Slavic gods, mentioned by a number of medieval manuscripts, and one of the few Slavic gods for which evidence of worship can be found in all Slavic tribes. According to Herodotus the Neuri were a tribe living beyond the Scythian, one of the nations along the course of the river Ὕπανις Hypanis, West of the Βορυσθένης Borysthenes, roughly the area of modern northern Ukraine and southern Belarus. Utigurs were nomadic equestrians who flourished in the Pontic-Caspian steppe in the 6th century AD. They were similar to the Kutrigurs to their west. Kurgan stelae or Balbals are anthropomorphic stone stelae, images cut from stone, installed atop, within or around kurgans, in kurgan cemeteries, or in a double line extending from a kurgan. The stelae are also described as "obelisks" or "statue menhirs".